Featuring a rich, natural red cedar wood finish, our cedar caskets are handsomely designed and solidly made. All of our cedar caskets are constructed of 100% solid cedar wood and gleam with a glossy lacquer, making it a lovely choice to remember your loved one. 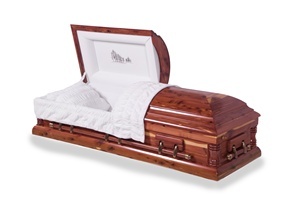 We offer 3 different styles in our cedar casket collection. Our American Casket showcases beautiful spindled corners and has an adjustable bed and mattress. With our Roanoke Casket, a custom, forest head panel gives off a handsome finishing touch, and with our popular Carolina Cedar, plush rosetan velvet lines the interior of the casket. All of our cedar caskets are standard sized and fit into a normal-sized burial vault. They all come equipped with a memory record tube as well. For a natural and woodsy feel, try a solid wood casket with Fast Caskets.